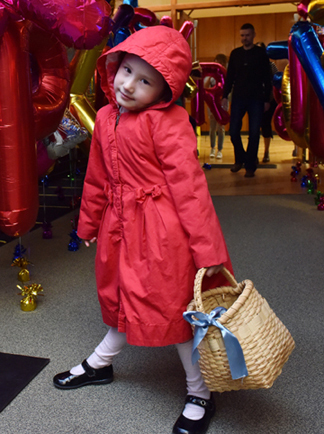 It was a day of much celebration and fuss…after 11 months of renovation, the gallery of the Cotsen Children’s Library has re-opened. Cue the trumpet fanfare! You might recall that Katie and I have been bunking in a multipurpose room for almost a year, driving each other crazy with our rock music and the way we chew our lunch salads. 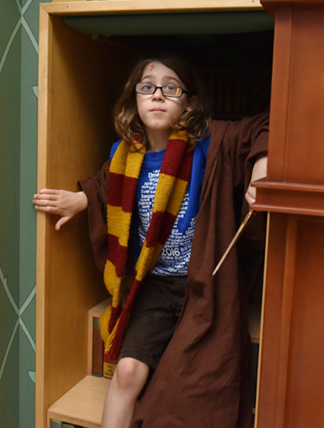 We did, however, host some fun off-site programs: a Tintin event, a Sherlock Holmes escape room, a Bhangra dance performance, and Pop Up story times in Rocky Hill, Pennington, and Bernardsville. 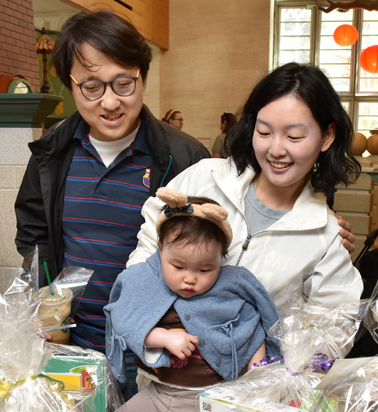 We wanted to welcome our community families back in style, so we devised a three-part celebration for our official reopening. 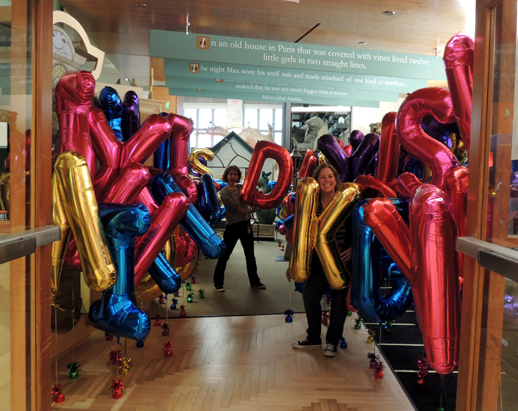 First, we filled the front of the library with 34″ inch helium alphabet letters. Yup, we inflated 130 letters and let kids charge through them. It was a huge hit! We ordered the balloons online from ACi Party ($4 each), and our balloon weights and ribbons from Oriental Trading Company ($8.50/dozen for the weights, $9 for a dozen, 60′ ribbon spools). The helium tank was donated by the good folks at Airgas, to whom we are very, very grateful. It took 3 hours and 4 people to inflate, tie, and position 130 balloons. 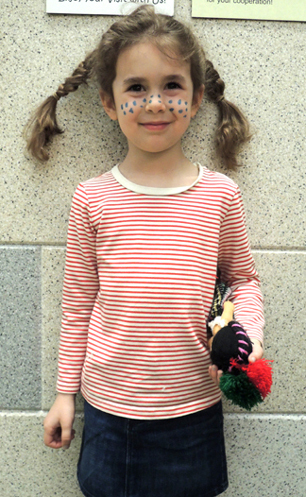 We are happy to report that, even with all the kids dodging in and out, we only had ONE balloon pop at the event. 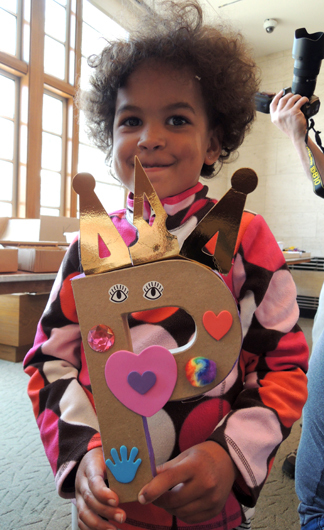 The back of the gallery had a hands-on art extravaganza – decorating paper mache letters! This isn’t the first time we’ve trotted out this very popular project, though it is the first time we’ve done it on such a large scale. 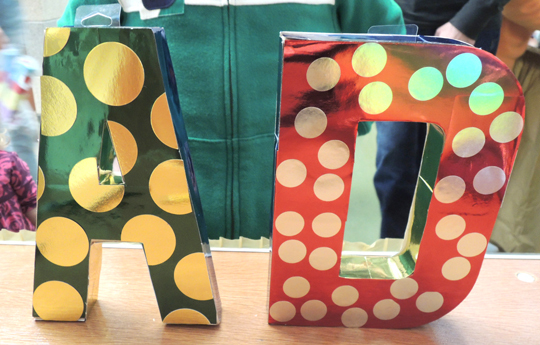 The 8″ paper mache letters were purchased from Consumer Crafts ($2 each). Some tape, glue, and a small mountain of art supplies later, the results were stupendous! 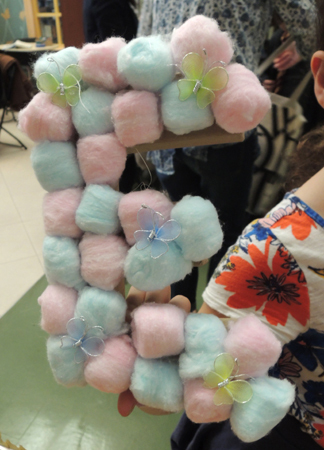 Here are my personal favorites: a fluffy butterfly E, a polka dot metallic duo, and a royal P! Also, this L garden. My daughter insisted I tell the entire internet world that this is her personal creation. She made me pinky promise! 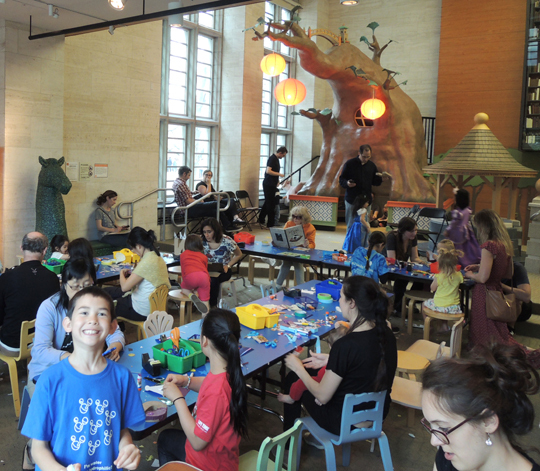 The art area consisted of 3 tables piled with art supplies and a hot glue station. 6 smaller tables acted as work stations for the kids (exactly the same as this event, actually). Here’s a quick snap of the work stations at the very the beginning of the event. But mostly we included this photo because of the epic photo bomb. 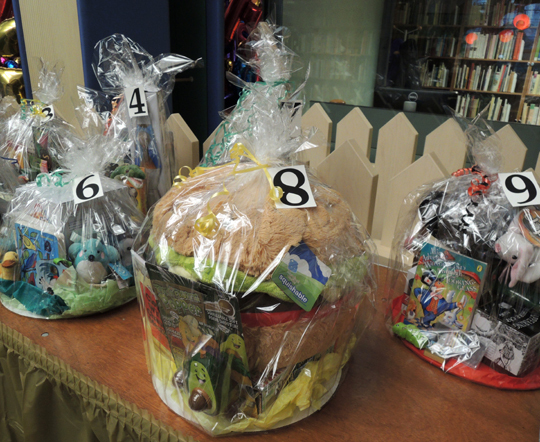 The third and final part of the event were gift basket giveaways. There were 11 baskets in total (one for each month we were under renovation). 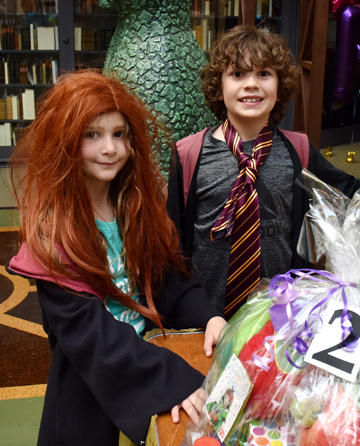 Every basket had a literary theme, from Chicka Chicka Boom Boom to Diagon Alley! Katie fell in love with the giant cheeseburger and squishy fries in the Cloudy with a Chance of Meatballs basket (we had so much fun shopping for these). And the cutest little Peter Rabbit, ever. 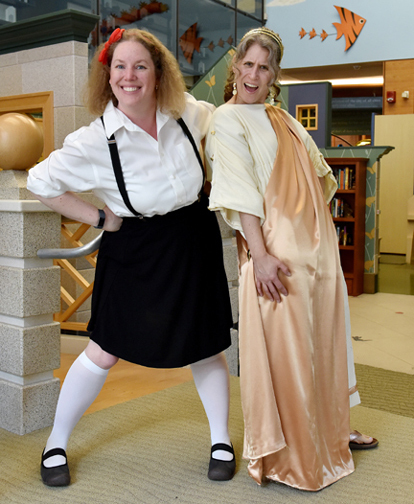 Katie and I were dressed up as well. 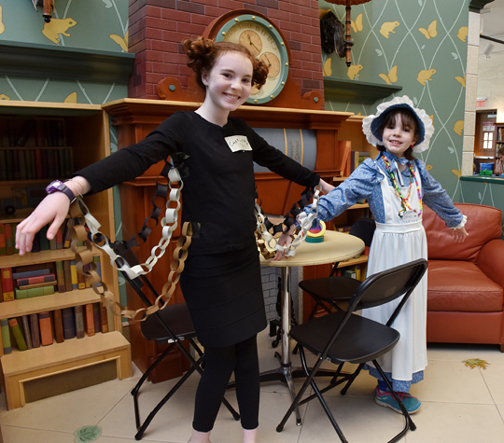 Katie was a truly amazing Eloise…and I was the physical manifestation of the Dewey Decimal classification for Mythology (291.13 was written on my forearm in Sharpie). 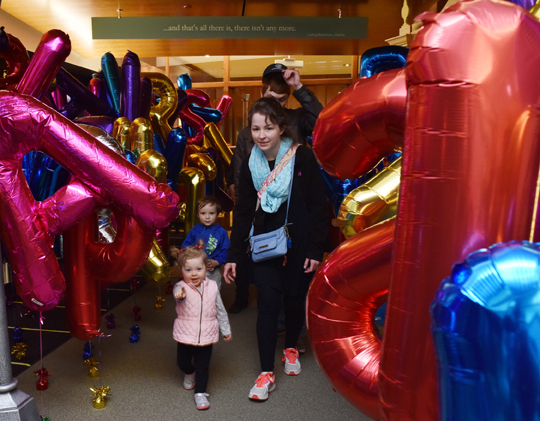 At the end of the event, we encouraged families to take home the alphabet balloons. We later received reports of balloon sightings all over town. Balloons sailed past restaurant windows, bobbed down sidewalks, and filled up the windows of cars. 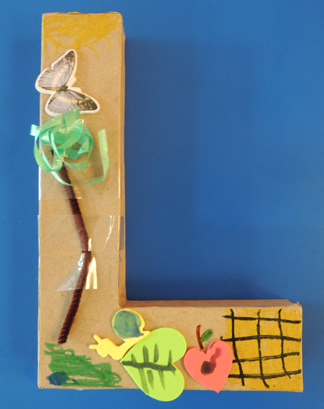 I like the idea of a floating, traveling alphabet. We even sent a few home with Princeton University students. And one balloon shucked its tether and ended up on the library ceiling. 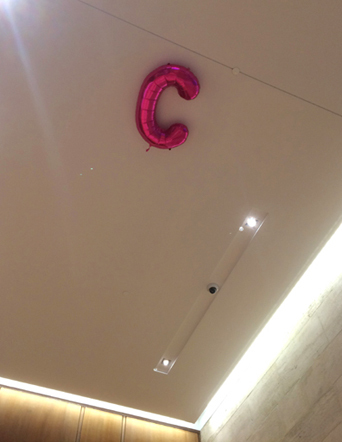 It’s sort of ironic that it’s the letter C that got stuck up there. 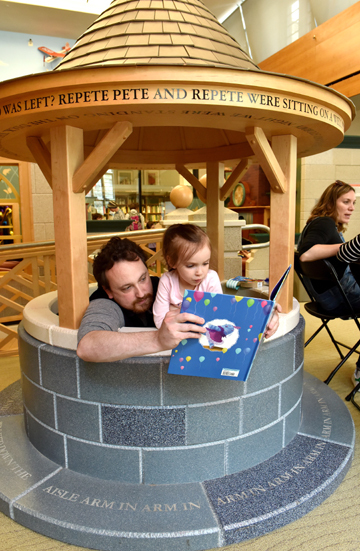 Amid the chaos, art supplies, and bopping balloons, we were delighted to see families taking time to enjoy stories together. And triple bonus points that these two are reading Betsy Bird’s Giant Dance Party. It has been a long 11 months, but we are delighted to be back. Please come and say hi! 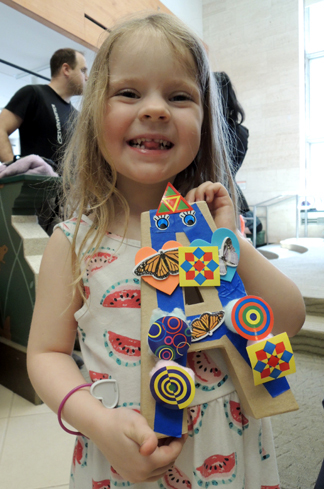 This entry was posted in More Connections and tagged activity, art, Bookscape, cotsen children's library, craft, craft project, creative, easy, event, gallery, kids, library, literacy, party, program, reopening by Dana Sheridan. Bookmark the permalink.